We loved the location very much. Close to many attractions and parks! The cabin had all the essentials and was very comfortable. It was just via email but excellent. I did forget a few items in the fridge (not intentionally) so am hoping that didn't cause problems or result in loss of deposit. Nice place, traffic noise loud in one bedroom. Clean & equipped with what we needed. Really nice location on quiet Croftville Road with a nice view of the big lake. The two small bedrooms are comfortable and the bathroom is serviceable but on the snug side. 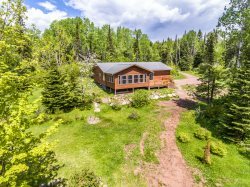 There really is no living room, just a small table in the kitchen but the front porch is fantastic and there is a nice little fire pit area in the yard and let's face it, outdoor living is where it's at in the summer up in Grand Marais. Overall it's a nice little cabin that's a throwback to a simpler time, although there is DirecTV and WiFi if you absolutely must get your technology fix.